How would you cope with going from a comfortable standard of living, with a husband, a young child and pregnant to being diagnosed with Multiple Sclerosis, a single mum of two, and “at the mercy of the state”? That’s the situation Jay Denton (48) from Colchester found herself in less than a decade ago, but one to which she has adapted, helped by making the most of available living aids/ assistive technology. The key adaptations to her rented bungalow have been, on the recommendation of her Occupational Therapist, the replacement of a conventional WC with a Closomat Palma Vita (with plinth to elevate the seat height), to which has now been added- following further deterioration in her condition- an Aerolet Tilt toilet lifter, also from Closomat. Closomat’s Palma Vita wash & dry (automatic bidet) toilets feature integrated douching and drying triggered by user preference: when the user remains seated and triggers the flush mechanism, the Closomat flushes and simultaneously washes the user’s bottom, followed by warm air drying. It eliminates the need to wipe clean, and all its associated considerations of dexterity, balance, hand: body contact, and potential urinal or faecal cross-contamination of hands, body or clothing. It also offers the best wash & dry performance available on the market. A raft of accessories enable its personalisation to individual user needs, initially, and as they change with time. By standing up and flushing, the Closomat can be used as a conventional WC. Closomat’s Aerolet toilet lifter replicates the natural motion of sitting down and standing up, supporting and balancing the user whilst gently, automatically lowering and raising them over the WC. 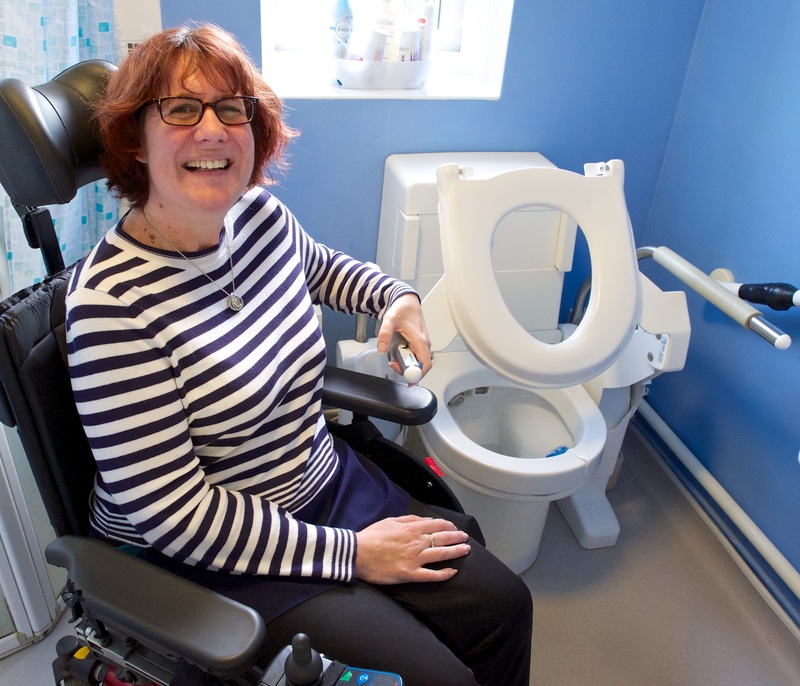 It is all controlled by the push of a button via integral arm supports, which simultaneously provide additional bracing as the resident transfers from wheelchair or frame to the toilet. Closomat is the only company to offer both a tilting and vertical version in a toilet lifter: the vertical is best suited for people with limited lower body and limb strength, whereas the tilt suits people with control over their legs. Explains Jay, “I don’t want to depend on people doing things for me before I really need it. The wash & dry functions of the Closomat mean I can ‘go’ and know I’m clean without having to worry about physically twisting, turning, bending to wipe. I’m tall (5ft 9ins) so the height of the toilet matters: I can’t use a ‘disabled toilet’ away from home as if I sit down, I can’t get up again without help! It’s great having the plinth added to the Closomat, as the toilet is set to the right height for me. And because the user triggers the douching and drying, the children use it too, as a normal loo. Closomat, founded 55 years ago, and still family-owned, is unique in its provision, in-house, of design advice, supply, installation, commissioning and after-sales service & maintenance for the Palma Vita and its range of accessible toileting solutions at home and away. Details of the Closomat’s assistive toilet care offerings, plus case studies from real-life users, can be found on its website www.clos-o-mat.com. Previous ArticleHow does the embattled social care sector survive 2018?